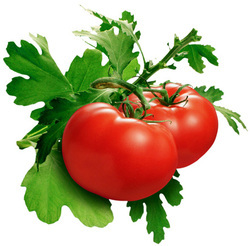 Tomatoes are self-fertile and with the exception of potato leaf varieties, currant tomatoes of the species L. pimpinellifolium and a few others aren't expected to cross with one another. However there have been differing experiences with different varieties and different growers. Perhaps the book Seed to Seed by Suzanne Ashworth gives the best understanding of the situation. "The ancestral tomato species could not reproduce by self pollination... It had a long style, extending far beyond the anther tube, to facilitate cross-pollination by insects... As this ancestral species evolved into the wild predecessor of the cultivated tomato it developed the ability to self-pollinate... With this development, the style became shorter but still protruded beyond the anther tube..
As the tomato migrated northward, the style continued to shorten and in some species totally retracted inside the anther tube, precluding any possibility of insect crossing." Perhaps the tomato is an example of a plant species that has been taken far away from its natural pollinators so it has evolved to be self-fertile. The experienced eye may be able to examine the flowers and work out which varieties may cross by noting how far the style is recessed into the anther tube. As we gain more info we hope to put a mark <C?> beside varieties that may cross with others that have a <C?> beside them. 'Beefsteak' and some other varieties that have double flowers may readily cross because of the exposure of the style. If a tomato variety produces some fruit with a tendency towards an 8 shape and some round fruit then exclude the 8 shaped fruit and select the round fruit for seed. Please accept that we are learning as we go and any feed back on varieties that have crossed would be very helpful. Tomatoes may be best fully ripened on the plant, but not over-ripened. One way for seed to be saved is to squeeze it on to paper and leave it to dry. It can be kept on the paper till planting and this is an easy method for small amounts. It isn't necessarily the best way and may not be the best way for storage and distribution. Perhaps the best way would be for fruit to be cut in half (across the middle, not through the blossom end and stem) and the pulp to be squeezed/scraped into a non-metallic container (glass jar is excellent) It should then be allowed to ferment until the seed comes clean from the pulp. Various books recommend adding water, but if it is not necessary to add water then I don't add it. The fermenting brew should be stirred at least twice a day, or if in a jar with a lid then shaken. Observation and experience will determine when it is ready for cleaning (generally 2-4 days, depending on temp and variety). Wash through a fine mesh kitchen strainer until only clean seed remains, then put the seed in a saucepan sized container with clean water and agitate it. The good seed will readily sink and the dodgy seed will remain suspended in the water or float. Separate dodgy seed by carefully tipping off water. Repeat process a few times. Return clean seed to strainer and shake (or use centrifugal force) to get as much water out as you can. Then place on paper or similar to dry. Seed to Seed says never dry tomato seed in full sun, however, my experience has been that the cooler days of autumn have been suitable for drying seed in the sun. Break up lumps of seed that will stick together and prevent drying. If seed doesn't dry quickly then it may start to germinate. Alma Small round red fruit on a tall bush. not good flavour. From Kay Baxter, Koanga Gardens, NZ. American. SSN 678 Medium large red fruit. Arbuckle Tall Maintained in the Arbuckle family, New Zealand, for about 80 years. Large pink pear shaped with firm flesh and few seeds. Late maturing. Betsy Bonn Small Medium sized round red fruit on a tall bush. Big Beefsteak <C?> save only round fruit. Don Camillo. SSN 424B Variable, needs some selection. Flat, round red fruit up to large size. Eva's Purple Ball. Red-pink medium sized fruit on a tall plant. Greek. Small red pointed fruit on a tall plant. Medium flavour. From Nancy Morgan. Holgen SSN 3493. Medium sized red fruit on a tall plant. Lazlo's Yellow Oxheart Tall Good flavoured large juicy oxheart shaped tomatoes. Seed from Andrew Cox. Mrs McKillops Very large fruit on a tall vigorous plant. Ozark Pink Medium sized, round pinkish red fruit on a tall plant. Polish Above medium flattish-round red fruit on a tall plant. From a fellow about 5 years ago. Potato Leaf Small medium, very juicy red fruit on a very tall vine. Good flavour. Scotland Yellow. Small to small medium yellow flattish round fruit on a tall bush. Diggers trials. Tiny Giant SSN 448 Small round red fruit on a tall bush. Yugoslavian Tall <C?> A lot of variation in the plants which suggests it may readily cross. The best of them were excellent. Needs growing on its own and selection. Want to graft your own tomatoes?